Super Bowl Sunday is officially in the rear-view mirror as many MLB teams have officially packed up the U-Hauls for their truck days. With just one week before the Seattle Mariners start up the series of pitchers and catchers reporting, the offseason is finally drawing to an end. Despite all the big names on the market, the offseason wasn’t filled with a ton of drama or excitement. In fact, it’s been rather boring — especially since all of the big name free agents are still on the board with very little likelihood to draw to a close in the near future. That being said, plenty of moves have transpired this winter. Some moves were better than others, as some rebuilding teams seem to be trying to contend in 2019 and beyond. So for that, let’s dive in and take a look at the winners and losers of the MLB offseason thus far. Brodie Van Wagenen had to make the big decision to no longer represent Mets ace Jacob deGrom before he could even accept the position as the newest general manager for the New York Mets. Since then, he’s done nothing but wheel and deal for proven talent. That started with the blockbuster deal on Dec. 3 that sent All-Stars Edwin Diaz and Robinson Cano to Queens in exchange for Jay Bruce, Anthony Swarzak, and prospects. Some feel as if that’s a risky deal –– mainly for the big-time contract Robinson Cano brings to the table. However, the veteran hasn’t missed a beat offensively, even after being suspended 80 games for PED usage last year. The Mets also added Wilson Ramos to call the shots behind the plate, which is an underrated move we all seem to forgot about through all of the Harper-Machado stale-mating. The number one issue going into the offseason for the Milwaukee Brewers was to address their rotation. While Dallas Keuchel still remains on the market and Zach Davies and Brent Suter are hopefully coming back healthy, the Brewers have failed to do so. On top of all that, arguably their best pitcher last year in Wade Miley was lost to the Houston Astros –– bringing that 2.57 ERA along with him. The Brewers did sign Yasmani Grandal to a one-year deal, but it does raise questions as to what kind of player they’ll be getting should they get to October. Grandal will be taking opportunities away from Manny Piña, all while being a .138 hitter last postseason. It’s tough to decipher what the plan is for the Reds in 2019. As far as most experts are concerned, the race for the National League Central is between Milwaukee, Chicago, and St. Louis. But it wouldn’t be wise to count out a young up-and-coming Reds team. This winter, the Reds have acquired Matt Kemp, Yasiel Puig, Alex Wood, Tanner Roark, and Sonny Gray via trade. The latter three all will take up a slot in the Cincy rotation. What strikes many is the fact that all five aside from Sonny Gray are due to become free agents after the 2019 season. However, at least for now, it appears as if the Reds have pieced together a really good roster around Eugenio Suarez, Scooter Gennett, and of course Joey Votto. 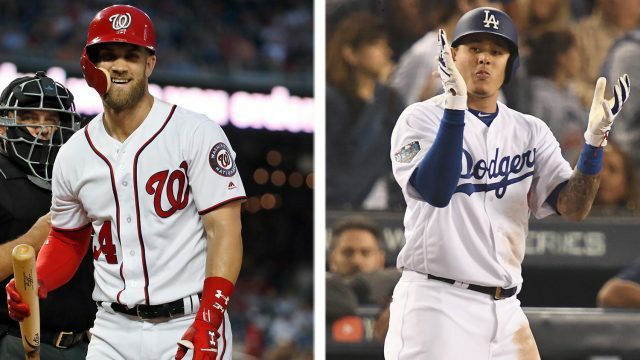 I don’t like to insert myself into these articles but I’d like to personally thank Bryce Harper and Manny Machado for taking so long to decide on where they will be signing this winter. In fact, the longer we wait, the more “mystery” teams pop up on social media. Last week it was the San Diego Padres. This week teams like the Mets, the Indians, and the Giants have found themselves into the sweepstakes for one of these players. Their other-worldly expectations regarding their contract haven’t been there –– and since then they’ve essentially been holding out. It’s been painful trying to track the rumors surrounding them, and I don’t imagine it ending any time soon. If you ask Yankees fans, they probably view this offseason as a huge failure for Brian Cashman, Hal Steinbrenner, and co. However, it really shouldn’t be viewed as such. People look at all the big names the Yankees were linked to and ultimately haven’t signed and appear to view it as if the front office is being cheap. Ironically, they’ve spent the most money out of every team this winter. But where’s it all going? Well, why don’t we ask James Paxton, Troy Tulowitzki, Zach Britton, J.A. Happ, D.J. LeMahieu, etc.? Not to mention re-signing Brett Gardner and C.C. Sabathia. People have overlooked the Yankees offseason because it’s been very un-Yankee-like, however, they’ve been big spenders on a multitude of free agents; and it certainly appears that they are in a great position for success this season. How can a reigning World Series champion team be a loser on an offseason list? Well, you’re going to have to ask President of Baseball Operations Dave Dombrowski. The Red Sox aren’t in the best financial situation, to begin with –– but that doesn’t excuse being nine days away from pitchers and catchers reporting, and still not having a closer set in stone. It’s been pathetic. Dave Dombrowski deserves a ton of credit for hiring Alex Cora and bringing this team to a World Series championship in 2018, and he’s made some really impressive minor league signings; however he still needs to do something to the major league roster, or else the Red Sox window to win now begins to close even quicker than we all expected. The Washington Nationals have a top-10 payroll in 2019 due to Stephen Strasburg and Max Scherzer being the two highest-paid players in the sport next season. However, despite the top-heavy payroll, the Nationals have one of the deepest teams in the National League. Even without Bryce Harper, the Nationals outfield is actually really impressive on paper. Between a young phenom in Juan Soto, and a proven gamer in Adam Eaton, the Nationals outfield is pretty solid. On top of that, we don’t give enough credit to the signings they have made. While they definitely overpaid for Patrick Corbin, they now have one of the best 1-2-3 punches in baseball. On top of that, the Brian Dozier and Aníbal Sánchez signings are both incredible one-year deals that could really help them in 2019. Particularly the latter of the two, as Sánchez seemed to figure something out in 2018 with Atlanta –– turning out his best ERA for a season since 2013. MLB free agency has gotten progressively worse over the course of the past few years. However, not nearly as bad as this offseason. If someone told me back in November that Bryce Harper, Manny Machado, Craig Kimbrel, and Dallas Keuchel would all be jobless by this time –– and that Jenrry Mejia would be signed before any of them — I’d have laughed in your face. That being said, it happened. Owners, GMs, agents, and players are all going at each other’s necks in negotiations this winter, and it’s only a matter of time before we get another strike. I dread the day that happens, but there are just so many signs pointing to it that I think it’s best we all brace for it. The MLB offseason sucked this winter, and it shouldn’t come as a shock if it’s even worse in 2019.